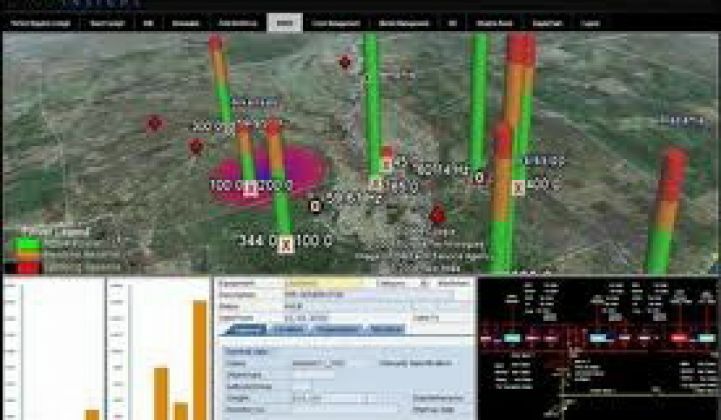 Geospatial data analysis startup Space-Time Insight goes live with its smart meter data mapping and analysis-in-a-box product. Space-Time Insight has built a business on crunching loads of real-time data and mapping it to geospatial models to help utilities make sense of it all. Since its 2007 founding, it has lined up customers including Florida Power & Light, San Diego Gas & Electric, California ISO and, in an under-the-radar fashion, Cisco Systems. On Tuesday, the Fremont, Calif.-based startup launched a “situational intelligence suite” of products, starting with a smart meter intelligence business application, meant to plug directly into utility deployments en masse. It’s the first in what’s intended to be a string of out-of-the-box systems to take utility asset management, smart grid and renewable power integration data and map it out on screen, in near-real time. That’s how Steve Ehrlich, vice president of marketing, described Space-Time Insight’s plan for taking its visualization, analytics and “situational intelligence” technology to a wider audience. While it hasn’t named any customers for the new application, it already has some testing out the applications it’s now rolling out as products. This sounds like a familiar argument. Over the past few weeks, we’ve seen a host of products and services aimed at linking multiple, disparate smart meter networks, including SK Telecom’s GridMaven U.S. subsidiary, Cisco’s field area network and network management system products, startup Proximetry’s cloud-based network management platform and the launch of a meter data analytics suite from meter data management provider (and Siemens acquisition) eMeter. The startup has some pretty cool visuals to show off in support of its claims, including its geospatial platform for California ISO, which helps the state grid operator manage data from grid sensors, wind farms, weather feeds and other disparate sources. Ehrlich wouldn’t get into more details on how Space-Time may be working with Cisco, beyond providing a visual interface for the networking giant’s grid operations and workforce and asset management systems. To manage the massive amounts of data involved, Space-Time Insight has integrated its technology with SAP HANA and can offload processing to data systems like EMC Greenplum -- the same platform that Silver Spring Networks recently announced it was working with to manage smart grid data. Space-Time is also working with IBM, OSIsoft, Accenture and Oracle on the massive data integration needs that today’s smart meter deployments have brought to utilities. Space-Time Insight saw about 300 percent revenue growth last year, Ehrlich said. It raised a Series A round in 2009 from Opus Capital, and while the parties didn’t disclose the dollar amount, one source pegged it at $2 million. This won’t be the last company announcing newer and better ways of integrating smart grid data this week. The DistribuTECH conference in San Antonio, Texas is bound to see more such news. Stay tuned for more details.